Saturn and two of its most fascinating moons, Titan and Enceladus, are dressed and dazzling in a special package assembled by Cassini’s imaging team. “During this, our 10th holiday season at Saturn, we hope that these images from Cassini remind everyone the world over of the significance of our discoveries in exploring such a remote and beautiful planetary system,” said Carolyn Porco, Cassini imaging team leader, based at the Space Science Institute in Boulder, Colorado. 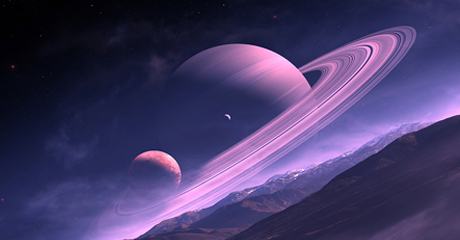 The globe of Saturn, seen above in natural color, is reminiscent of a holiday ornament in one of the photos. The characteristic hexagonal shape of Saturn’s northern jet stream, somewhat yellow, is visible. At the pole lies a Saturnian version of a high-speed hurricane, eye and all. The photos making up the special package are available at this NASA press release. The Cassini-Huygens mission is a cooperative project of NASA, the European Space Agency and the Italian Space Agency. The imaging team consists of scientists from the U.S., England, France and Germany.